I surprised my small group of friends (and myself!) on one of our “gourmet pizza” evenings by pulling this wine out of my cellar. I didn’t tell the small group of 5 what it was I was surprising them with to see if they could identify the country of origin, variety and “guesstimate” the vintage… I was not surprised when they had difficulties with this blind tasting as I was a bit surprised by the vitality of the wine considering the age. Also unexpected was the bouquet which emerged from the glass. The first thing that I have to reiterate is that I not only pulled the wine from my cellar, but I also opened and served the wine at cellar temperature. A perfect 13 degrees Celsius (55.5 degrees Fahrenheit). After pulling the cork, which was in excellent shape, and some wine was poured into the glasses, what emerged from the glass was a massive herbal bouquet! Ok, now back to the bouquet! Slight petrol/sulfur hints which burnt off after some time in the glass, but always present were these amazing aromas of spearmint and Thai basil with hints of “minerality”!! We all agreed that the Thai basil was dominant along with other herbs. Very interesting. ON the palate, this Auslese wine with an 8.5% alcohol content, was almost completely dry after 20 years as you might imagine, but there was a mild sweetness at the front end when the wine first hit the tongue, but it quickly gave way to a very elegant but high level of acidity. 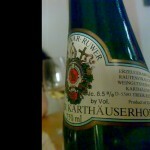 Much more elegant in fact that many of the Karthaüser’s I have tasted in the past. 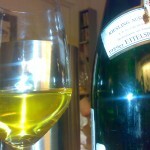 Oh, of course, on the palate there were plenty of ripe lemons and a splash of kumkwat.. The wine was very concentrated and the finish very long. A very nice wine for drinking today. If you own this wine, I would enjoy it now even though I feel it still had some cellar life left.. But why wait, drink it! 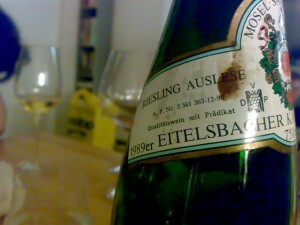 This wine is exactly the reason that I am in love with the Riesling! !